Mark was Initiated in the Universal Lodge No. 8219 in December 1993 and became the Worshipful Master in 2000. He has held several offices within the Lodge including Mentor, Assistant Director of Ceremonies and Treasurer. He is a member of three Lodges within the Province viz., Universal Lodge No. 8219, North Kent Masters’ Lodge No. 9062 and the Fiennes Cornwallis Lodge No. 9279 and is an honorary member of four further Lodges viz., Union Waterloo No.13 (Atholl Lodge Assoc. ), Swanley Lodge No. 5873, St Giles & St Luke No. 6668 and Lodge of Sincerity No. 6868. Mark was Exalted in the Universal Chapter No. 8219 in January 1997 and became MEZ in June 2012. He was appointed a Provincial Grand Steward in October 2011 and became a member of the West Kent Provincial Grand Stewards’ Chapter No. 8565 in March 2012. Mark is also a member of Regents Park Meridian Chapter No. 9202 and is a Founding member of the Hervey Chapter No. 1692 (primus Scribe N). Mark was appointed an Assistant Provincial Grand Master in May 2016 and received promotion in Grand Rank to PSGD in April 2017. 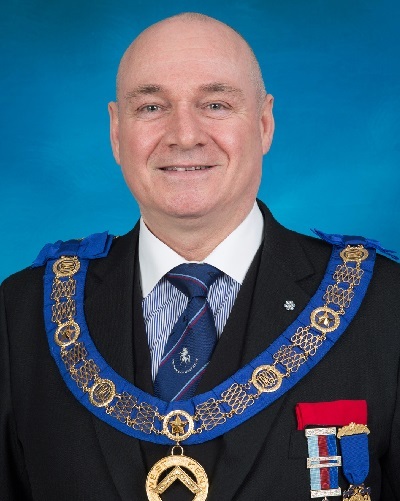 He was appointed Deputy Provincial Grand Master in May 2018. Mark is a Freeman of the City of London, a member of the Worshipful Company of Security Professionals and a playing member of the MCC. He is also a Mark Mason and a member of the Rose Croix.